Coin featuring Aemilian. Legend: IMP. AEMILINVS PIVS FEL.f AVG. Aemilianus (Latin: Marcus Aemilius Aemilianus Augustus; c. 207/213 – September 253), also known as Aemilian, was Roman Emperor for three months in 253. Commander of the Moesian troops, he obtained an important victory against the invading Goths and was, for this reason, acclaimed Emperor by his army. He then moved quickly to Italy, where he defeated Emperor Trebonianus Gallus at the Battle of Interamna Nahars in August 253, only to be killed by his own men a month later when another general, Valerian, proclaimed himself Emperor and moved against Aemilian with a larger army. 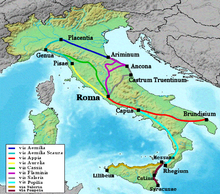 Aemilian was born in the Roman province of Africa. According to the 4th century source Epitome de Caesaribus, he was born at Girba (modern Djerba, an island off the coast of Tunisia) and was a Moor; a reference in the same source hints that he was born around 207. The 12th-century historian Joannes Zonaras, who calls him a Libyan (that is, coming from western Egypt-eastern Libya) rather than a Moor, and another chronicle of the 13th century hold that he was forty at the time of his death in 253. With his few men, Aemilian left his province unguarded and moved quickly towards Rome to meet the legitimate emperor Gallus before the latter could receive reinforcements. While Aemilian descended upon Rome along the Flaminian Way, Gallus and Volusianus had him proclaimed "enemy of the State" by the Roman senate, then exited Rome to meet the usurper. This strategy suggests that Aemilian's army was smaller than theirs, as they probably did not expect reinforcements to come in time but trusted their larger army to win the clash. The two armies met at the Battle of Interamna Nahars near modern Terni, at the southern end of the eastern branch of the Flaminia, and Aemilian won the battle; Gallus and Volusianus fled to the north with a few followers, probably as a delay tactic before the arrival of reinforcements, but, in August 253, at Forum Flaminii (modern San Giovanni Profiamma), on the western branch of the Flaminia, they were killed by some of their own guards, who thought that their betrayal could earn them a reward. Coin of Aemilian, showing at the obverse the god of war Mars, a reference to the military virtues of the emperor. Legend: IMP. CAES. AEMILIANVS AVG. P. F. AVG. / MARTI PACIF. However, Valerian, governor of the Rhine provinces, was on his way south with an army which, according to Zosimus, had been called in as a reinforcement by Gallus. But modern historians believe this army, possibly mobilized for an incumbent campaign in the East, moved only after Gallus' death to support Valerian's bid for power. Emperor Aemilian's men, fearful of a civil war and Valerian's larger force, mutinied. They killed Aemilian at Spoletium or at the Sanguinarium bridge, between Oriculum and Narnia (halfway between Spoletium and Rome), and recognized Valerian as the new emperor. 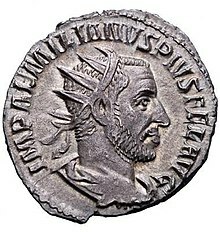 After Aemilian's death, which happened between late July and mid-September, a damnatio memoriae against him was declared. ^ a b Varner, Eric, Mutilation and Transformation, Brill Academic Publishers, 2004, ISBN 90-04-13577-4, p. 209. ^ Zonaras, 12.22; Epitome de Caesaribus, 31.2; Zosimus, i.29.1; Chronographer of 354. Only Aurelius Victor reports Aemilianus' death by illness (31.3).